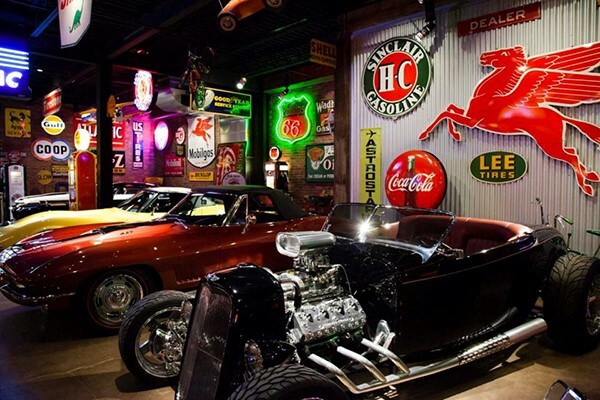 Oyster Bay, NY – “It’s a combination of a gas station, Disneyland and a man cave,” owner and Oyster Bay resident David Jacobson says. “Long Island has a tremendous car culture. I thought Oyster Bay was a natural fit.” Enter the showcase and you are faced with a collection of 17 cars displayed behind velvet ropes, and more than 1,000 automotive signs hanging all over. “I like old stuff,” says Jacobson, 51. “We wanted everything to be as authentic as possible. It represents a different time.” Cars range from a 1974 Ferrari 365 GT4 — the first 12-cylinder mid-engine Ferrari ever made — to a 1965 Volkswagen bus to a 1953 Chevrolet 5 window pickup truck. There’s even a 1958 BMW Isetta, which Jacobson found in Oregon. “The Isetta is loud and obnoxious,” Jacobson says. “It feels like a motorcycle with a shell around it.” There’s a 1932 black Ford Roadster, completely restored. “This is one of the most fun cars you will ever ride in,” Jacobson says, grinning. 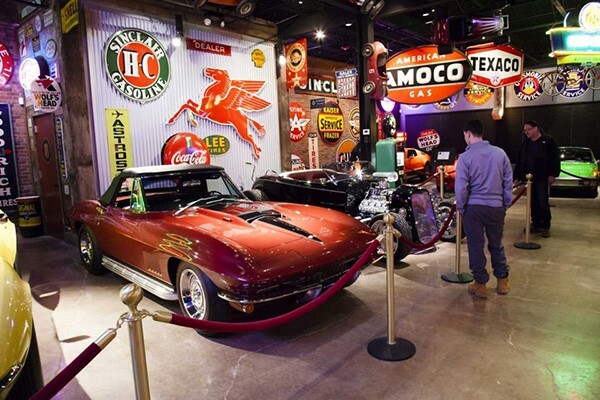 The cars — most are owned by Jacobson, but a few are on loan from fellow collectors — will be rotated every four to six weeks to keep the display fresh. As the owner of GrooveCar auto buying service, he knows something about the allure of a good ride. While some may come purely to check out the wheels, there’s a service area where you can get your vehicle hand washed for $29.99 or a full detailing from $250 to $1,000. 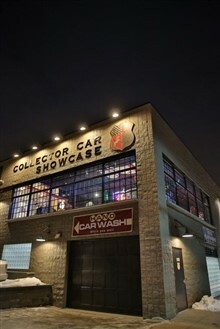 Annual club membership ($150-$500) allows access to a lounge area and the first floor, where more cars are on display and a working slot car racetrack is available for members only. The museum also is hosting catered events for up to 100 people, from adult birthday parties to corporate events to fundraisers. New York, NY – Of the 4,200 new automobiles sold in the United States at the turn of the century, gasoline powered less than 1,000. 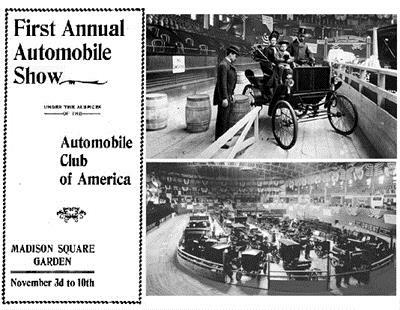 On November 3, 1900, America’s first national automobile show opened in New York City’s Madison Square Garden. An innovative assortment of electric, steam, and “internal explosion” engines powered these horseless carriages. New manufactures like Olds Motor Works of Lansing, Michigan, built models of each kind to compete in the developing market. The manufacturers presented 160 different vehicles at the first national automobile show. Future leaders of the nation’s greatest transportation industry gave driving and maneuverability demonstrations on a 20-foot-wide track that surrounded the exhibits. A wooden 200-foot ramp tested hill-climbing power. 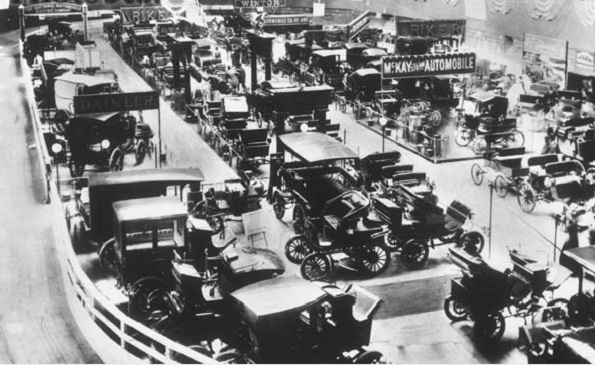 Automobiles powered by internal combustion engines at the 1900 National Automobile Show were primitive. The most popular models proved to be electric, steam, and gasoline…in that order. About 48,000 show visitors paid 50¢ each to see the latest automotive technology. Hundreds of “Hansom” cabs built by the Electric Vehicle Company worked well, but heavy lead-acid batteries, muddy roads, and lack of electrical infrastructure confined these early electrics to metropolitan areas. Thomas Edison spent years working on battery power for automobiles, but abandoned the effort. 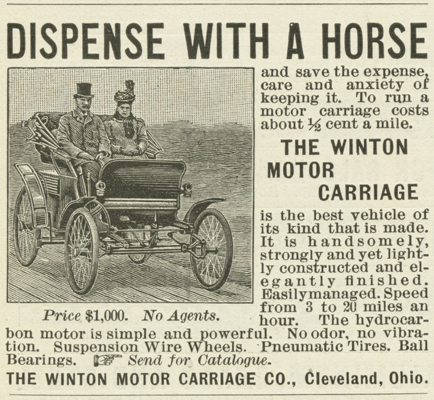 This ad for the Winton motor carriage – often identified as the first American automobile ad, according to the Henry Ford Museum – appeared in a 1898 issue of Scientific American magazine. Consumers favored “steamers” over their gasoline-powered competitors. Steam-powered automobiles traced their roots back to 1768, when a French military engineer, Nicholas-Joseph Cugnot, built a self-propelled steam tricycle to move artillery. By 1900, manufacturers like Bridgeport, Connecticut-based Locomobile (from the words locomotive and automobile), Stanley Motor Carriage Co., Tarrytown, N.Y., and others boasted of their products’ safety and touted the virtues of simple steam power over “complex and sinister” internal combustion engines. Locomobile produced 750 steamers in 1900, second in sales only to Columbia & Electric Vehicle Co. of Hartford, Conn., but consumers complained of the time required to heat boilers and the necessarily frequent stops for water. Progress in the development of internal combustion engines soon outpaced steam technology. At the turn of the century, about 8,000 vehicles shared mostly unpaved roads with horses and wagons. Automobiles powered by internal combustion engines at the 1900 National Automobile Show were primitive, noisy and cantankerous. Most were based on Nikolas Otto’s 1876 four-stroke design and ran on a variety of “light spirits” such as stove gas, kerosene, naphtha, lamp oil, benzene, mineral spirits, alcohol, and gasoline. The critic was wrong. Gasoline, once an unwanted byproduct of kerosene refining, cost only about 15 cents a gallon in 1900 and produced dramatic increases in engine horsepower. Despite the absence of “filling stations,” gasoline was readily available in a market where electric lights were making kerosene obsolete. The refining industry needed a product to replace kerosene and gasoline was it. In 1901, Olds Motor Works sold 425 models of a gasoline-powered “Curved Dash Runabout” for $650 each. Four years later, when the model was discontinued, almost 19,000 had been sold. America’s consumer preference for gasoline-powered internal combustion engines was thoroughly established.